Once a new hard court is constructed and in play it is all too easy to neglect maintenance of the surface. The positioning of the court will have major implications as to the amount of maintenance required. The aim of regular maintenance is to maintain the playability of the surface for as long as possible. The situation of the court and the amount of play it is subject to will lead to variations in the timescales mentioned below. The court should not be played on when organic debris is present; leaf debris etc will be broken down and pushed into the pores of the asphalt, this then rots down and becomes a growing medium for moss/algae and broad-leaved weeds. A Cleansweep machine can be left on the court and used on the surface by anyone; staff/players/members etc should be encouraged to clean the surface at least once weekly, more often when leaf litter is present. The aim being to remove all organic debris from the court before it breaks down. Other machines that can be used include leaf blowers, vacuum machines, and pedestrian power brushes. Most tennis court/mugga paints are textured to improve foot grip. To maintain foot grip as much as possible courts should be pressure washed on an annual or biennial basis. Care should be taken not to remove the paint coat or stone from the surface especially on older courts. The court will usually be need to be sprayed with a mosskiller/algaecide on a regular basis, moss has two main growth periods a year in spring and autumn, if you are in a moss area spraying should be carried out routinely at these times with spot treatment between times if needed. Dead moss should be removed routinely. If moss is left on the surface untreated it can act as a sponge in winter, holding water, if this then freezes it can break the asphalt up. In our trials Algon although no longer sold as a moss killer produced the best control for moss control. If the courts suddenly become slippery in the autumn this may be caused by an algal growth. As the climate changes algae becomes more of a problem as longer periods of the year are conducive to algal blooms. Sudden unexpected puddling or areas of sludge in low lying areas are all indicative of algal growth. This can be chemically treated with RBT or similar, a second application may be needed after 7-10 days. Dead alage can then be washed or brushed away. After approximately five years, depending on usage and maintenance, grip levels on the court will be falling, the paint will be deteriorating and drainage will be suffering. At this point the court will need a deep clean and a repaint. Usually at this stage the application of a binder to hold the asphalt together is not needed. Maintenance can then continue as before. After approximately 10 years the court will need deep cleaning and repainting again some stone loss may be detectable and the court will probably need the application of a binder coat to control this. 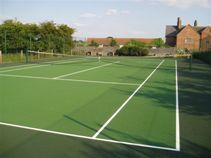 Cracks and splits may appear in the surface as the court ages these can be repaired by a specialist using cold lay macadam and other materials. If possible it is best to perform these repairs immediately before repaints. Further cleaning/painting operations can be carried out during the life of the court, eventually the porosity of the surface will fail due to repeated paint applications and the surface will start to break up. At this stage, up to twenty years, the court will need to be resurfaced and the whole cycle can start again. The above guidelines represent the thoughts of Sweepfast ltd at this time and should only be used in conjunction with the guidelines of your installer and paint manufacturer.